Dominic Desautels has been Principal Clarinet with Symphony Nova Scotia since 2012. 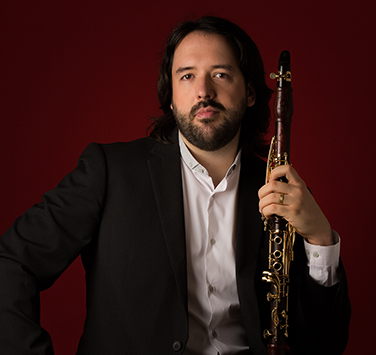 Regarded as one of Canada’s prominent clarinetists, Dominic enjoys an active career in Canada and beyond. He made his debut as a soloist with the Toronto Symphony Orchestra in 2004 and has since been featured with orchestras including the Orquestra Filarmônica de Minas Gerais, Orchestre de l’Université de Montréal, Orchestre de la Francophonie, Sinfonia Lanaudière, and Symphony Nova Scotia. He is a faculty member at Dalhousie University, guest artist/faculty at Scotia Festival of Music, and a member of Halifax’s Rhapsody Quintet. Dominic is co-artistic director of the Montreal-based chamber ensemble The Parcival Project which has toured across Canada and South America and with whom he can be heard online on YouTube. He studied at the Conservatoire de Musique de Montréal, Western University, and the Glenn Gould School of the Royal Conservatory, then earned a Bachelor’s degree from the Université de Montréal in 2007. Upon graduation he became Principal Clarinet of the Orquestra Filarmônica de Minas Gerais in Brazil, a position he held until he moved back to Canada in 2012. Dominic also has served as acting principal clarinetist with ensembles such as the Toronto Symphony Orchestra and the Canadian Opera Company. Recently named a Backun Artist, Dominic plays on Backun MoBa clarinets made with cocobolo wood, and crafted in Canada. Dominic is currently serving on the Symphony Nova Scotia Board of Directors as Musician Representative. It is one of my greatest passions. I love the human aspect of music teaching… I probably get more out of a great lesson than the students themselves! I love how I have to challenge and question myself constantly when I teach. I was very inspired by my great teachers, and I always hope to give it back by inspiring my students. I have many! As a clarinetist I would say the Mozart clarinet concerto is certainly my favourite, along with his clarinet quintet and also the Brahms quintet. Otherwise, Beethoven’s late string quartets, most of Ravel, Mahler symphonies (1 and 4 especially), and Richard Strauss’s Four Last Songs.